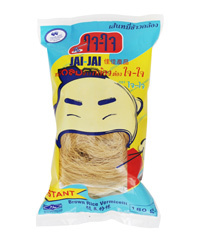 Lhian Thai Rice Vermicelli Co.,Ltd. Available in 150g, 200g, 500g, and 2,700g bags. 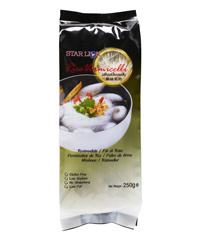 Soak the rice vermicelli in boiling water about 3 minutes. Loosen the noodles with fork, strain off the noodles and rinse with cold water. Available in 150g and 200g bags. Soak the rice vermicelli in hot water about 3 minutes. Loosen the noodles with fork, strain off the noodles and rinse with cold water. 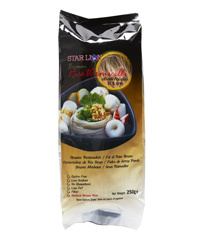 Soak the rice vermicelli in boiling water about 5-8 minutes. Loosen the noodles with fork, strain off the noodles and rinse with cold water. #Percent Daily Value are based on a 2,000 calorie diet. 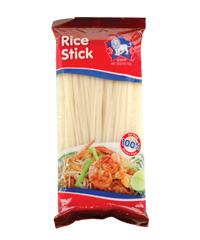 Soak rice stick in warm water for 8-10 minutes or in hot water for 5 minutes and drain well. Available in Round, Square or Triangular Shape. 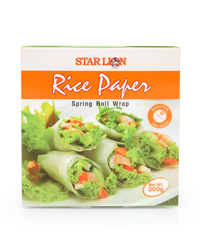 Soak a rice paper in room temperature water about 1 minute. Remove from the water and place it on a clean working surface such as cutting board. Wipe away any excess water with the edge of your hand. Place your favorite filling such as shredded chicken, peeled cooked shrimp fresh vegetable. Leave the space on all sides for wrapping. Fold the bottom up over the filling. Fold the left and right side inward to close the ends of the roll then roll it up. The roll can be serve cold of deep fried. 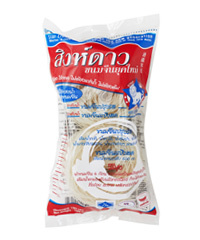 ©2013-2015 Lhian Thai Rice Vermicelli Co.,Ltd. All right reserved.